Tree House Accessories – Rope Swings and Tree Swings! We are happy to install a rope swing for you or help you buy your own parts. We offer tree swing installation primarily in the Greater Philadelphia area. If you are more than a couple hours from West Chester, PA, then you may find a cheaper quote from a local source. Tree swings cost from $350 to $950, depending on material costs, difficulty of the installation, and travel time to your location. The second tree swing is always less because travel time is already covered. We can set ropes very high in trees, giving you an amazing swing that will make your yard the talk of the neighborhood. You can buy rope swing seats and rope by the foot from Treehouse Supplies. Single Rope – One single rope hangs down through the center of a disc seat, usually circular. We sometimes call these “Monkey Swings” because you can swing in any direction and appear to be hanging from a vine like a monkey! You typically need a good sized branch over hanging a wide open area with no other tree trunks or obstacles in any possible swing path. When these are installed over a slope or on a 30-40 foot tall branch, you should hold on tight because you’re in for quite a ride! Double Rope – These are traditional swings, with two ropes or chains hanging each side of a wooden plank or a commercial plastic belt. These are best installed on a horizontal tree house beam or a nearly horizontal tree branch to keep the swing operation relatively free of twisting. Two-seater porch swings also fall into this category and are enjoyed by kids and adults alike. Tire Swings – These are heavy and require secure mounting above. Since kids can fall off in any direction, a large area must be clear in all directions to prevent injury. The structure that the tire swing is attached to must be able to withstand the motion over time. Hanging Chairs – There a several manufacturers of hanging chairs made from Nylon and wood. Most of them hang from a single rope, and this rope can attach to a 6-10′ high spot or something higher like the monkey swings above for the option of either a relaxing or a more active rope swing ride. We sometimes have these in stock, but clients are always able to purchase whatever kind they like best and we’ll install it under or near the tree house. Many of them have drink holders, foot rests and inflatable pillows built in. Sit back and relax. There are 2 schools of thought regarding the best way to attach rope swings to tree branches. We have asked many arborists about this. Some of them believe it is best to put an eye bolt or through-bolt (somewhere between 1/2″ and 3/4″ diameter) through the tree branch vertically. This leaves an eyelet at the bottom to tie rope swings to. The advantage is that there is no chance of a rope or chain girdling or rubbing a branch during use. The disadvantage is that drilling holes in trees damages them. Other arborists think it is better to tie a slip knot (our choice is the running bowline) around a branch that loosens when load is removed, allowing the tree to continue growing. The advantage is that it is easier to install and doesn’t initially put any holes in the branch. The disadvantage is that some people believe that the rope contacting the branch could do greater damage over time than the eyebolt. The jury is still out, so whether you are a rope swing owner or an arborist who has seen different styles over the years, please email us if you have any opinions or data that may help contribute to this topic. We all care very much about the trees we work in and want to minimize our environmental impact. We use ductile action hardware to connect rope swings to the under-side of a tree house or a traditional monkey bar with swings hanging underneath. These allow for almost insignificant friction which means less chance of having to replace hardware down the road. The commercial grade is usually galvanized steel, and the residential grade is composite. These rope swings are usually the double rope variety, and are lots of fun especially with two side by side. Rope swings need to be inspected regularly to make sure they are safe to use. Common problems include excessive wear on chain if metal is rubbing on metal. Usually this is because the wrong swing hardware was used for installation. 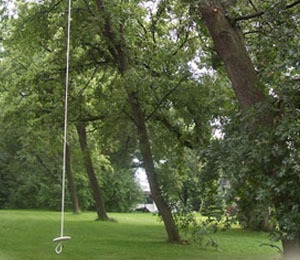 If hardware such as throughbolts or j-lags is used to attach a rope swing to a tree branch, then the hardware should be replaced when the tree completely grows around it. You don’t want the movement of rope to be restricted by tree tissues because either the tree or the rope will lose the battle. If a knot is used to wrap around a tree branch or a beam of the tree house, then you have to watch the areas of connection. Avoid tree abrasion or rope abrasion and change the attachment if necessary to keep the tree healthy and the rope safe. Also beware that the tree does not grow around the rope (or any other material you use), as it could girdle the tree.